The fifth cycle of the Micro-Bakery begins, and oh, the Spring is beautiful! The French Country Levain turned out beautifully as well, I might add. The morning began grey and rainy, the wind coursing through the open kitchen windows. Thankfully, the cooler air slowed the dough down on Friday night and made the process more leisurely. Due to the rain, I car-delivered the bread again, though it cleared up as soon as the first loaf left my hands (go figure). Had I known of the sunshine to come, I may have been more apt to dry off the bike seat and ride forth. Hopefully I'll get a sunny day next weekend and be back in the saddle. 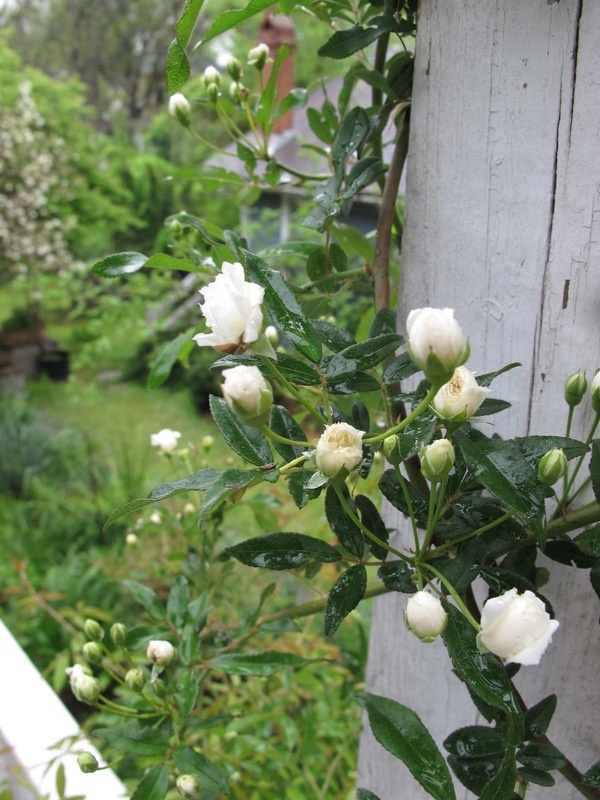 The trees and vines are blooming like children, spreading open and singing silently alongside the birds. This is, perhaps, my favorite time of year in Durham. Just because you run a micro-bakery doesn't mean you've attained bread mastery. I'm learning more and more each week, and the learning curve has only grown steeper with Durham's spike in warm weather! Last weekend, March 17, I let the dough rise too long before shaping it. This weekend, I thought I had a better system in place. I used cooler water, and predicted a 5-hour rise (rather than 7-hour) would do the trick. Besides, whole wheat doughs like this one usually take longer to rise because of the bran in the flour, which works against the gluten. But alas, by the time the dough was shaped it was already full of enormous gas bubbles. These bubbles should have bloomed during the bake and made the bread nice and hole-ly, but they formed too early. Thus, the bread did not rise much in the oven, thus much smaller holes in the bread. I think 3-4 hours of initial rise would have done the trick! As in the pics, the last batch actually did spring a bit in the oven, but the first eight loaves did not. Between rain, pollen, and allergies, I decided to deliver bread this week in the car. It was the fourth and final week of the fourth micro-bakery cycle. It's hard to believe, but this has been going running off and on since late October! Thanks subscribers and supporters! Happy St. Patrick's Day everyone! All is luscious and green, and there's rosemary in the bread! This week the weather really warmed up, meaning that the dough behaved differently. I used cooler water to try and slow down the rising time, but I guess if the kitchen is 75ºF vs. 65ºF it makes a big difference! One of the bowls of dough was actually spilling over the top! The extra warmth, in addition to extra time, made this a very intense bread: very sour, very heavy on rosemary. Turns out I picked more rosemary than I needed, so I threw in as much as I thought the bread could handle. On my palette it's great, though some butter or mild cheese would be an excellent way to cut the flavor. In the next week or two, I hope to procure some photos from the bread workshop I led last weekend, and to offer a blog post about what the workshop was like and how it went (it was great, by the way). Casting bread on the waters! After a few weeks off, the Micro-Bakery is back in action (see exhibit A). 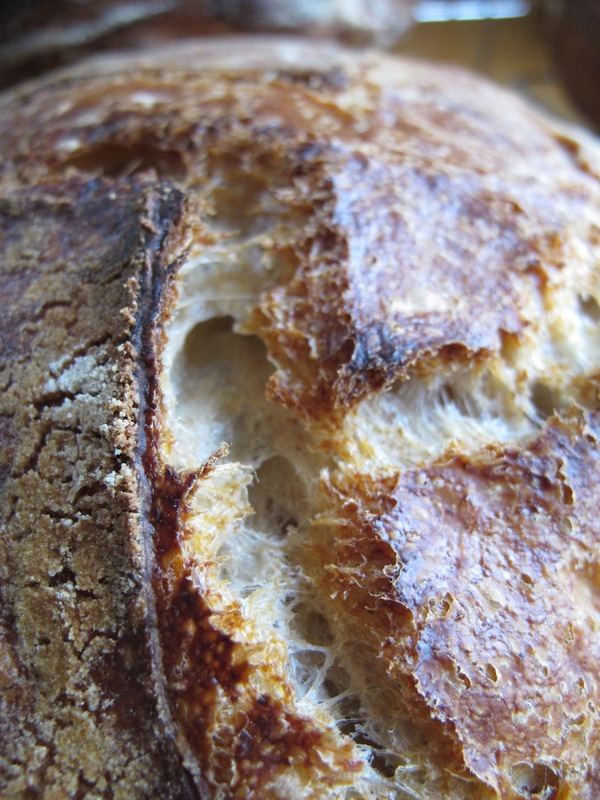 This week's loaf was French Country Levain, a mostly white bread with a mild natural leavening. I call it the loaf from which all others spring and by which all others are measured (at least in my repertoire). Actually this weekend, due to some tough scheduling, I had to add use the levian before it had adequate time to sour, meaning that the bread is good, but more mild than usual. Rain threatened in the sky as I prepared for deliveries but thankfully the ride was pleasant and dry. Thanks to a good friend I acquired some zip-ties to better secure my milk crate to my bike, meaning that deliveries were all the better (no more milk crate wobbling to and fro while going over bumps). I'm still perfecting my methods for not denting the loaves as I ride around; I hate to deliver a good loaf of bread that looks bruised, even if only a little. Many thanks to any and all supporters of the Micro-Bakery. 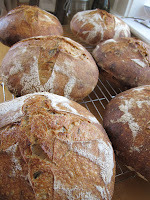 I'm getting ready to lead a workshop on bread making and spirituality next weekend – super excited. Today marks the end of Micro-Bakery Cycle III. Many thanks to subscribers and supporters, and especially to my wife, who's been putting up with my Friday-Saturday bread routine for many weeks. For the record, this weekend more than made up for my disappointing bake last week. For some reason, I was more in tune with the process this time, and that made all the difference. I mixed in the evening, went out, then came back to find the dough puffy and soft (a good sign). I heated the oven a little hotter, and made sure to slice (score) the dough more carefully. And voila, the loaves expanded beautifully in the oven, came out with a rich, burnished crust, and sang as they cooled on the counter. I'm taking the next couple weeks off from the Micro-Bakery, due to some travel and my birthday, but I got some classic bread books in the mail this past week and look forward to trying some new recipes during my time off! Note: if the pictures seem redundant, it's because I was reveling in the explosive rising of the loaves. It's the year of the dragon, and jagged, fiery dragon bread is back. LMB is a micro-business located in the West End of Durham, NC. The model: Bread subscribers sign on for four weeks at a time and get a warm loaf of artisan bread bicycle-delivered to their home every Saturday afternoon. Bread varieties rotate at random.